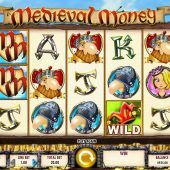 Medieval Money slot is a 20 pay line game over 5 reels and the theme is self-explanatory. The card symbols are formed from shiny armour and the character symbols are what you'd expect, various cartoon queens, princesses and kings along with a knight that has a huge nasal protuberance. Annoying tweedling medieval harpsichord and pipe music trills away in the background with hens clucking and when wins land formed of the characters they make involuntary noises and giggles. You get single symbols aside from the highest paying game logo which is stacked in pairs, and awards a decent 50x stake for 5-of-a-kind down to the lowest card award at 5x stake. The jester's hat forms the Wild which like the archery target bonus symbol will only appear on the centre 3 reels and the Wild does not multiply wins. There are however, 4 possible bonus rounds. Landing 3 archery targets on reels 2, 3 and 4 will trigger a pick-me screen with 9 further targets on. You shoot your arrow into one and it reveals one of 4 pretty uninspiring bonuses. Money Bags Picker - select a money bag to reveal a prize of between 2 and 50x stake. Yawn. Spell Picker - a tired looking wizard has 5 coloured potions paying between 5 and 100x stake. Select one, and choose to reject or accept it. If you get the 100x best prize, the round ends. The fifth one revealed if you reject the others is what you'll get. Snore. Dragon Path Bonus - the dragon has a hoard of treasure which is worth 200x stake. Spin the wheel (like the Leprechaun bonus in Rainbow Riches slot) and either get 1, 2 or 3 moves along the path picking up cash multipliers until you land on a skull or reach the big prize. Wow. Joust Free Spins - 7 free games on different reels and there are Knight's helmets on reels 1 and 5 which are Wilds. One is red, the other blue. All other symbols are marked red and blue too. Get the Knight's helmets on the same row reels 1 and 5 and there will be a tedious graphic whereby the red or blue Knight prevails and all symbols overlaid with the winner's colour become Wild on that row between the combatants. Given that even 5 Wilds is a mere 25x stake, not great potential and there is no possible retrigger either.